The M777 howitzer has transformed the dynamics of modern-day artillery. Its rapid deployability, ultra light weight and ability to fire the latest longer-range precision-guided munitions means it is coveted by many Armies, but all of this comes at a price. 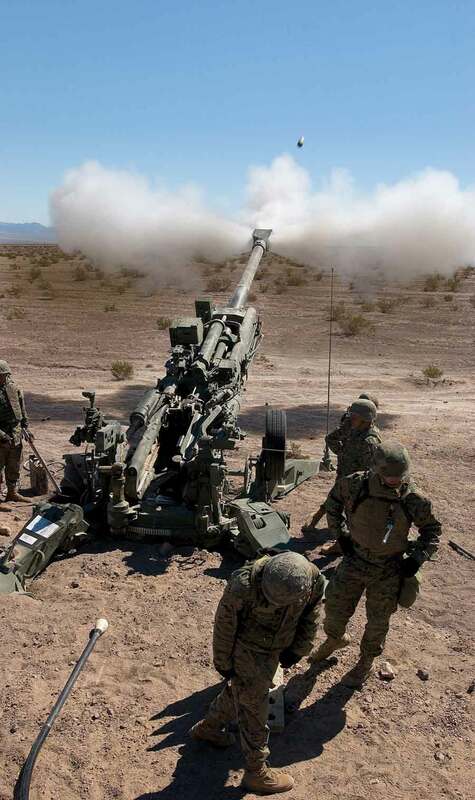 In February 2016, the United States formally approved India's planned procurement of 145 BAE Systems M777 155 mm howitzers for the Indian Army under a Foreign Military Sales (FMS) deal worth an estimated $700 million. The deal will make India the fourth nation to adopt the weapon. India's planned procurement was bogged down with delays to the point where BAE Systems began to close down its production facilities for the weapon, having completed all existing orders. But in June last year, the Indian Ministry of Defence (MoD) re-issued its earlier letter of request to the US government for the planned deal. In order to meet an earlier commitment to establish an in-country assembly, integration and test facility for the M777, in February this year, BAE Systems revealed that it had selected the Indian company Mahindra as its business partner for the proposed Indian programme. Although the 155 mm howitzer has become the weapon of choice for many armies, its range and firepower comes at a price. This is a relatively heavy weapon that in towed form can weigh typically 7,000 - 9,000 kg and requires a crew of eight or more. In the early 1980s, the UK company Vickers Shipbuilding and Engineering (now part of BAE Systems), conceived the idea of using modern materials and fabrication methods to create a weapon that was approximately 3,000 kg lighter than the widely-used M198 255 mm howitzer. The goal was to achieve a total weight of not more than 4,000 kg. When briefed on the concept, the US Army agreed that if the company developed such a weapon, the service would submit this to a full evaluation. Efficient structural design was required to minimise the weapon's weight. One weight-saving measure was the use of high-strength titanium alloy in many of the major structural parts. Another was the use of hydraulics to operate the breech, load tray, recoil and wheel arms. Together, these measures led to weight savings of more than 3,000 kg. In June 1989, firing trials of what was then designated the 155 mm Lightweight Howitzer commenced. Trials in the US started soon afterwards and the weapon was subsequently adopted by the US Army and Marine Corps (USMC). Low-rate initial production of what was formally designated the M777 began under a 2002 contract worth $135 million. This resulted in the first howitzers being delivered in 2003 to the USMC, the first service to take the weapon into service. A joint-service multi-year contract for full-rate production was awarded in 2005. The basic M777 variant uses optical fire control. The addition of an on-board power source, satellite- navigation and inertial navigation subsystems, a radio, Gun Display Unit and Section Chief Assembly created the digitised M777A1. The M777A2 standard adds a Block 1A software upgrade and an Enhanced Portable Inductive Artillery Fuze-setter (EPIAFS) for use with Excalibur precision munitions. The weapon is compatible with the full range of 155 mm projectile types, including Raytheon Missile Systems' and BAE Systems' M982 Excalibur and the Bofors 155 Bonus. Standard unassisted projectiles can achieve a range of 15 miles (24 km), while assisted projectiles can reach 19 miles (30 km). Excalibur precision-guided munitions have a maximum range of more than 25 miles (40 km) with a Circular Error Probable accuracy of less than 10 m.
Future projectiles are expected to include the Multi-Service Standard Guided Projectile (MS-SGP), a sub-calibre 127 mm rocket-assisted projectile fitted with sabots. Being developed by BAE Systems, this will draw on technology from the US Navy's 155 mm Long Range Land Attack Projectile (LRLAP) and could have a maximum range of 100 km. Although normally crewed by a team of seven, the M777 can be operated by five. Rapid insertion and extraction are key factors in battlefield survivability. The old M198 howitzer took more than six-and-a-half minutes to emplace at a new firing position, and more than 10 minutes to displace, but the corresponding times for the M777A2 are less than two-and-a-half minutes. The sustained rate of fire is two rounds per minute, rising to four rounds per minute in rapid fire. The M777 has seen combat service in Iraq and Afghanistan, starting in 2006. More than 40,000 rounds have been fired in action. Although the M777 is a relatively modern weapon, the US DoD is already taking steps to ensure its long-term support. In September 2010, Anniston Army Depot began a pilot programme to develop the skills and an facilities needed to overhaul the M777. This included teaching technicians how to weld titanium and creating a new 500 square metre facility in which this specialised process can be carried out. Until recently, any damage to the cradle of a M777 took the weapon out of service, but BAE Systems engineers in Hattiesburg, Mississippi, have devised a way of using a laser tracker to accurately measure the movement of the howitzer's barrel through its full arc of motion. This data allows specifications to be devised for replacement slipper pads (the metal spacers, which slide along a runner as the weapon is raised and lowered), components that must be custom-made to provide the exact fit needed to maintain the gun's accuracy. Installation of the new pads allows the weapon to be returned to service. 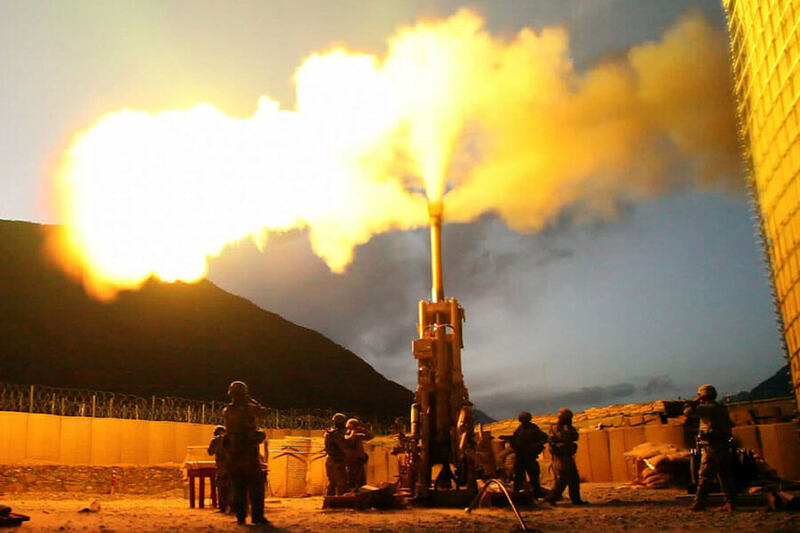 The US Army's Extended Range Cannon Artillery (ERCA) project funded by the US Army Armament Research, Development and Engineering Center's science and technology office is intended to develop the technologies needed to extend the range of all 155mm artillery. It is developing the new XM907 cannon, XM1113 rocket assisted projectile, XM654 supercharge, an autoloader, and new fire-control system. The Program Manager Towed Artillery Systems (PM-TAS) dual-funded Army and USMC programme hopes to adapt the ERCA cannon to the M777 to determine the viability of a cross-platform solution that would include a towed M777ER. Engineers from Benet Labs and the Picatinny Arsenal have modified an M777A2 to install an existing 52-calibre barrel modified to match the weight of the proposed XM907 cannon in place of the current 39-calibre barrel. The new configuration adds about 1.8 m to the system's barrel length and around 450 kg to the overall weight. External grooves on the barrel allow engineers to install weights at different positions in order to move the weapon's centre of gravity forward or rearward as required. There are no plans to conduct firing trials, but the modified M777 will be towed in different weight and centre-of-gravity configurations in order to demonstrate that the re-barrelled weapon still meets mobility requirements. Tests will also be conducted to determine how difficult it might be to elevate and traverse. Component fabrication for the M777ER is due to begin in the first quarter of 2018, with hardware integration expected to end by mid-2020. Invented in Sweden towards the end of the 17th century, the original howitzers were designed to fire a cast-iron projectile filled with gunpowder or incendiary material, rather than the solid round shot fired by the cannons of the time. They used a smaller propelling charge than guns, so needed a greater elevation angle to achieve a given range. This gave the projectile a steep angle of descent that allowed it to land in the interior of fortifications. By the early 20th century, artillery weapons that fired projectiles at higher velocities, but at maximum elevation angles of less than 35 degrees, were classified as guns, while shorter-ranged weapons with shorter barrels that fired projectiles at lower velocities and an maximum elevation angles of 45 degrees or more were classified as howitzers. This distinction became blurred during the First World War, as the maximum elevation angle of guns began to increase, as did the barrel length of howitzers. The resulting weapons became known as gun-howitzers, or simply howitzers. Since the Second World War, most land-based artillery pieces have combined high muzzle velocity, long barrels, long range, and maximum elevation angles greater than 45 degrees. As a result, the terms gun, howitzer, and gun-howitzer are used interchangeably. ABOUT THE AUTHOR: Following an earlier career in engineering, Doug Richardson is a defence journalist specialising in topics such as aircraft, missiles, and military electronics. The author of more than 20 books on various defence topics, between 1998 and 2013 he was the editor of the monthly title Jane's Missiles & Rockets. He also writes for the Journal of Electronic Defense.